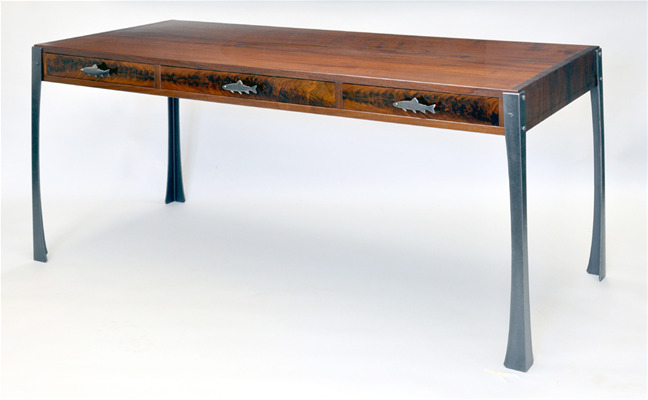 This desk features an adaptation of our "egypt leg" (which can also be seen in wood on our "Egypt Leg Cherry Desk" below), elegant houndstooth dovetails on the ends and a secret compartment. The brook trout drawer pulls are 3/16th stock waterjetted to shape and then detailed by Sam in the metal shop. The back of the desk is finished with shop-made crotch veneered panels. To see a video of the technique we use for our hand-cut dovetails and more pictures, check out my blog, www.dorsetcustomfurniture.blogspot.com, under "A Walnut Desk...The Bethlehem Steel Series," April 17, 2011.